I wanted to come back from the holiday break with a joke. I really did. I had a joke set aside, and was ready to get home, and start drawing. But when I walked in the house, I looked at the TV, and the headline read... "Satirical Cartoon responsible for 12 deaths." I just stared... and listened to the recount of the events. Let me start by saying this... No cartoon in history... satirical or otherwise, has ever been responsible for a death. A cartoon is an image. It is artwork. Those viewing it, are responsible for the deaths. People kill other people. 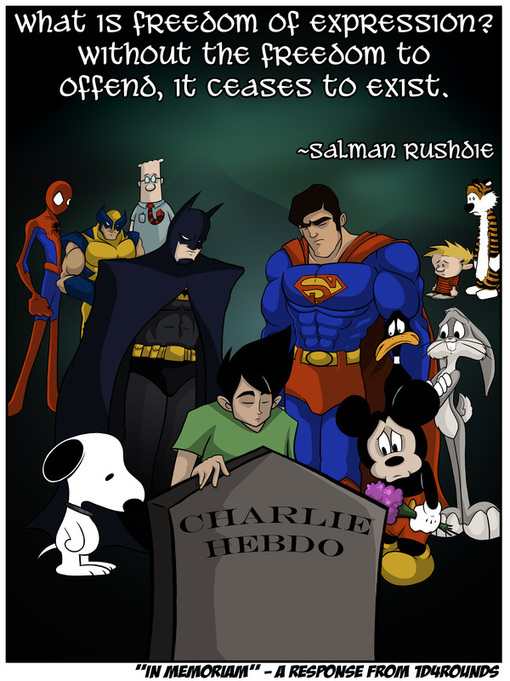 A cartoon, even one that might offend... Is just that... an offensive cartoon. Anyone, who can justify a murder, because of their feelings about a cartoon... Is already damaged beyond repair. They are murderers, using a cartoon as an excuse. And without it, would find ample other reasons to kill. I want to be clear... This is not the muslim faith, responsible... But rather a small, extremist group, bending the context into a disgusting parody of itself. People with these tendencies exist across all backgrounds, all faiths, and all cultures, and they are the true villains in this story. I urge anyone who hears this story, to reserve judgement for those few, extremists... Rather than directing your outrage unjustly. On a side note... One of the many people who died in this tragedy, was Jean Cabut aka "Cabu hates people" (his pen name). An amazing artist, and writer, who worked in the office. His work, along with many of the others who died... should be found, and read. Perhaps this hits me harder than some. But it occurs to me, that these artists were just doing what I have done a thousand times before. Point and laugh at some absurdity, through a publication of artwork. And I truly believe that they deserve your praise, your respect, and at very very least... your thoughts. I want to give my condolences, as well as my praises... to the artists of Charlie Hebdo, as well as any artist in history that was ever slandered, hurt, or killed, because of their work.